In the first of what I hope is an ongoing series of interviews with fellow mathematicians, here is my conversation with Richard J. Nowakowski. We sometimes just call him RJN for short. Richard works on graph theory and combinatorial game theory at Dalhousie University, where he is a University Research Professor. He completed his M.Sc. and Ph.D. degrees under the supervision of Richard Guy at the University of Calgary. RJN won the Adrien Pouliot Award in 2007 from the Canadian Mathematical Society for his outstanding contribution to education and outreach. The interview focused on a few questions about RJN’s life and work, and is presented here more-or-less verbatim. AB: How did you first become interested in mathematics? RJN: I am one of those people who was always interested in Mathematics. In grade two or three, I was winning gold stars for being able to add up columns of three digits numbers much faster than anyone else. So I received reinforcement very early on. Anytime anything mathematical came along I was just interested in doing it. Just like sports where you go out and develop your talent, I just developed a little more mathematical talent by being more aware and interested in doing those little things. One of my aunts was a teacher and we had this 11-plus exam in England. I was at a small school; there were six out of thirty who might have a chance passing the exam. She got us all sorts of interesting books to study. I wasn’t good on the English side, but the math ones I found really, really interesting. Ages eleven to fifteen, I was doing eight to ten subjects each year in school. Sometimes teachers were not math teachers but they still taught math. I had enough confidence with friends to essentially ignore their teaching to take the content and work with that. When I immigrated to Canada in 1968 I was sixteen, and they put me in Grade 11 although I could have gone to straight to university with my academic background. I went from an all-boys school to a co-ed school. There were more distractions! A new country, new social scheme, everything. But I enjoyed it. In first year university, I almost failed Calculus because I missed the midterm playing Bridge instead. However, I saw all the material two to three years early in England, and I had close to 100% on the final and assignments so passed the course. There was a new guy Jedrzej Sniatycki at University of Calgary who was given the task of teaching a new course called Sets and Mappings. There were seven of us in that course, who ended up being Honours Mathematics and Honours Computer Science. We spent a lot of time together in the next four years. We took the course and had fun with it. He did things like the different kinds of infinities of sets which was new to me. Sniatycki wasn’t bound by doing the straight proofs. He had a lot of fun with material, and we did as well. I was thinking I would study either Mathematics or Physics, maybe even astronomy. Physics bored me though, and they weren’t do anything new in Calculus. The Sets and Mappings course was new math that I hadn’t seen before. AB: Who influenced you to study mathematics as a student? RJN: I took Sets and Mappings in first year. In second year, the guy teaching abstract algebra did some game theory like Nim. 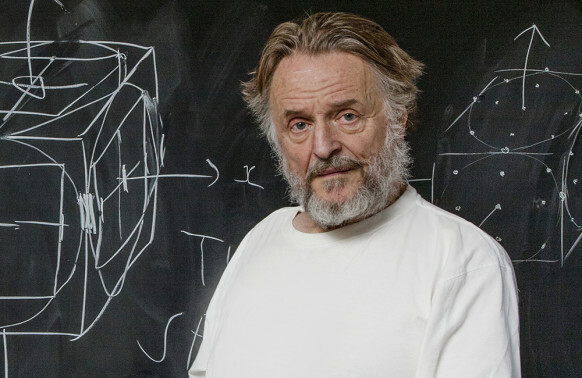 John Conway was visiting Richard Guy at Calgary, who I didn’t know at the time. I met Conway, and I still remember the first question he asked me: “What is 1 + 1 + 1?” I answered “3”, and he replied “Oh you are so naive!” Of course, he was talking about combinatorial games. At that time, I became aware of Richard Guy, mainly because of the noise his machines would make. He was running an electromechanical computing machine, which ran in base ten rather than base two. It ran 24/7, was loud, and had moving parts like ball bearings. About once a month the machine would let out this high pitch whine or scream. I would be walking down the hall past his office, hear that scream and wondering what he was doing. I had a number theory class with Guy. He wowed the honours students in that class. He came in one day talking about continued fractions for π. He first wrote out π to thirty decimal places from memory on the board, and wrote the lecture with no notes. I was sitting in the back and was wowed. Guy’s assignments had about some easy questions, a few interesting ones, and always one final one where I was clueless. My classmates and I would meet the night before over pizza, having completed all but the last question. We had no idea how to do the last question. That was a lot fun. AB: Was the final question like a research problem? RJN: Some of it could be research, and some was extreme problem solving. At the end of one of his eight am classes, I told Guy that the last question on the latest assignment was tough. He said it had a solution that was one line, but I wrote two pages in my assignment. I figured I did it wrong. This was Wednesday and the next Monday he came back and said that we were going to write a paper together based on my solution. I misunderstood the question but in an interesting way. It did appear as a paper several months later, and it is still the longest and best math review of any of my papers. Again, it is this notion of inclusion. There are many mathematical questions that no one has thought about, and even undergraduates can have good idea about these things. In my fourth year, a new guy came along, Ivan Rival, who was definitely a type-A personality. He was also inclusive. His approach in teaching was that while he knew more than his students, that was due to experience. He would present problems and we would talk and think about them. Rival would work with anyone. So even though he wasn’t my supervisor for either my Masters or PhD, up until recently he was my most prolific co-author. I wasn’t planning on becoming an academic, but then I got an NSERC scholarship. I thought Guy was doing interesting things and I wasn’t looking for a job, so I worked with him for my Masters, and with Ivan on the side on partially ordered sets and combinatorial number theory. Guy said that if I stay with him for a Ph.D., then he would take me to Cambridge for a year. I took him up on it. In my second year, I went to Cambridge, and again the atmosphere there was centred on inclusion and playfulness… Conway was there, along with others; Guy was visiting Conway and they worked on their book Winning Ways. Someone would say here is a new problem and everyone played and did things. AB: Would you explain the role of games in your mathematical work? RJN: I would separate out play and games. Mathematical play was what Guy, Rival, Conway and his cadre of people did a lot. Inclusive play. Stretching yourself. You don’t know where the next idea is going to come from. I got interested in games by watching what they were doing. I would say that is separate from play. I didn’t do much with combinatorial game theory until the late 1990’s. Quickly after I got to Dalhouse, I was classified as a graph theorist and taught the subject. I had a couple of interesting questions early on. George Gabor (a Hungarian statistician working at Dal), asked me the question that became Cops and Robbers. As I thought about it, the technique for characterizing cop-win graphs came to me, and it was identical in form to a problem from partially ordered sets on fix-points. It was like two different questions, but the same technique. It was clear this question was going to set me off in a different direction. I found that very, very intriguing. I tried to roll the two ideas together over the next few years. As my graduate students will tell you, I did so spectacularly unsuccessfully since all my conjectures were false. But it was good for the graduate students and they could tell me I was wrong. AB: What are some of your favourite results? RJN: Definitely I would mention the characterization of cop-win graphs, where can one cop capture the robber. The one I also enjoyed was the characterization of well-covered graphs of girth five or greater. These are graphs where the smallest cycle is a 5-cycle, and you consider independent sets of vertices, where no two are adjacent. For instance, think of fire stations: we don’t want them to be too close. Well-covered graphs are those where every maximal set of these independent vertices are all the same size. This make it really easy to find one, as it is a hard problem to decide which is the biggest one in general. This was joint work with Bert Hartnell and Art Finbow who were on sabbatical at Dalhousie University. A well-covered graph. Every maximal independent set has size four. One of the reasons I liked this problem was because of the adrenaline rush. For a few months, we couldn’t get any results. My subconscious was trying to tell my conscious mind that there was something there. It doesn’t always work that the subconscious is correct. After three months, every single idea was incorrect. Finally, we came to the solution. It was an odd time in a way but it was a lot of fun to finally finish. I enjoyed most of my research projects, especially working with other people. One of the strangest ones was working with Ivan Rival on a problem of his on partial orders. He thought in terms of formulas, while I am very visual. I said “Do you mean the following?” drawing something rough on the board. He looked at it for thirty seconds and said “Do you mean the following?” I asked the same again, and we went back-and-forth like this for four hours. At the end, we had a paper! It wasn’t a major result, but it was interesting to see how two people could do this back-and-forth. It was like playing tennis. AB: Do you think of mathematics as science or art or both or neither? RJN: I think the perception in the discipline has changed over my lifetime. Early on it was something you did in your office by yourself. In that sense, it is more like an art. We have moved on to more collaboration, which requires a slightly different mindset. But now with computers, we can find new things. We can get intuition from computers that we could never get before. So we are moving from the all-artistic model of mathematics, to a mix of the art and the science. I think the art is still important… we are not doing this for the money that’s for sure! So there has to be some sort of internal satisfaction that you get from the work. You have to be doing something you enjoy, which is again on the artistic side. You might have a question that will create lots of papers and attention, but it’s totally boring as far as you are concerned. I think the artistic and creative sides are important. You keep working on it, it keeps your interest, and you find those little niches. You will get a lot of satisfaction. AB: What role do students have in your research? RJN: I took the model of Richard Guy and Ivan Rival. I find it a lot of fun to work with people. I do my best work with others, and most of my work is with co-authors. Graduate students don’t have as much experience or background, but they do have a lot of raw talent. We are never quite sure where the ideas will come from. It is a way to keep me young, I suppose. Seeing them take off is great. Through my tenure as Chair of the department, it was necessary to have good graduate students to keep me coming out the other end as a sane research mathematician. I think students are very important and the best ones are self-motivated. They have to have confidence, not necessarily a great background. They need confidence to stand up to me and say I’m wrong. It’s one of the reasons I like games; if you play a game by yourself it gets really boring. Banff, 2012. L to R: WIlliam Kinnersley, AB, Shannon Fitpatrick, Margaret-Ellen Messinger, Stephen Finbow, Doug West, RJN. AB: Do you have any other interests besides mathematics? RJN: My big three outside academia are: playing Go; Bridge (which I gave up after that incident with the Calculus midterm); and Chess (years ago back in my school team; I don’t play now). I also like international folk dance and English and country dance. You find a reasonable number of scientists and mathematicians who do that, and I am not sure what it says. My other two hobbies are hiking and gardening. AB: What do you think are some of the important directions for the future of mathematics? RJN: That’s a tough one. I focused my career on discrete mathematics. What I am seeing there is a move to more dynamic questions like Cops and Robbers and graph cleaning. Also things with probabilistic approaches are becoming more important. I am not so good at those approaches, but I can see what it means and how it changes the way we look at problems. I think someone going into discrete mathematics now needs a well-rounded education: for instance, it would be good to have background in algebra and the probabilistic method. Programming skills are very helpful. Being able to use those is important since they can give the intuition on the problems where pen and paper aren’t enough. Even if you don’t have the right background, if you are well-rounded then you can find the right people to ask. Right now in my work on combinatorial games, we are doing some new stuff on scoring. We have to ask people in category theory and algebra for help. To algebraists, no one has looked at theses particular structures since the 1960’s. But we are asking questions no one asked before in this area. If one of us didn’t have algebra in our background, we would be doing a disservice to Mathematics by putting out incomprehensible stuff.